Rub the inside of a 5 1/2-quart slow cooker with the cut sides of the garlic. Discard the garlic. Stir the broth, soup, water, wine, mustard, cornstarch, cheese, nutmeg and black pepper in the cooker. Cover and cook on LOW for 1 hour or until the cheese is melted, stirring occasionally. 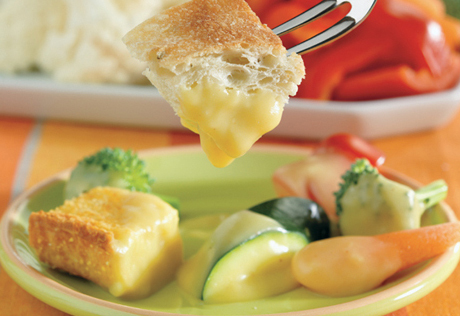 Serve with the garlic bread and vegetables on skewers for dipping. Tip: This recipe may be doubled.